• Choosing Save All Changes to save all changes since you last opened the book. 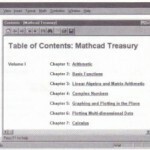 Once Mathcad saves an annotated copy of the Electronic Book, you’ll see an asterisk beside the title whenever you turn to an annotated section. 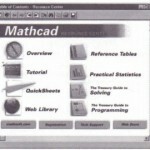 The next time you openhanded Electronic Book, Mathcad will open the annotated rather than the original copy.If you’ve made changes to an Electronic Book and you haven’t chosen one of the above options, you’ll be given the option of saving all changes you have made or of reviewing the changed sections, one at a time, and deciding whether to save or discard the changes.